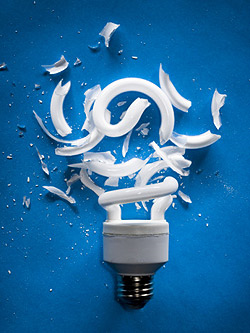 Not long ago I dropped and broke a compact fluorescent lightbulb (CFL) in the garage. D’oh! I had a vague recollection that there’s a procedure you should follow to safely clean up broken CFLs, due to the small amount of mercury inside them. So, geek that I am, I jumped on the computer to look up what to do. Before anything else, air out the room for 15 minutes (easy, I got sidetracked and spent half an hour on the computer answering emails!). Scoop up the glass pieces using stiff paper and place them in a sealed plastic bag (don’t use a broom or vacuum – you don’t want mercury getting airborne where you can breathe it in). Use sticky tape to pick up the remaining tiny glass fragments and powder. Wipe the area clean with damp paper towels. Place all cleanup materials into the plastic bag, seal it, and then seal the whole lot in a second plastic bag. Store the sealed bag of waste somewhere safe outside the house until you can dispose of it safely. Kiama area residents can drop it to Council’s Lamp Recycling Program at the Minnamurra Waste Depot. Other areas, contact your local Council to find out how to best dispose of it. Wash your hands thoroughly after the cleanup. If the breakage occurs on carpet, rugs, bedding or other soft materials, there are slightly different cleanup steps recommended. Refer to the above web site for full instructions. So, does this mean that CFLs pose a significant health risk? I don’t believe so. There are lots of things people use in modern life that can impact our health if not handled correctly, from printer toner to potting mix. As long as you are aware of the hazard, handle the item or substance properly, and know how to deal with a spill safely, then the risk is minimal. More thoughts here: CFLs and Mercury. @Brad: That’s an interesting study, thanks for pointing us to it.